Southwark Playhouse Confidence takes you back a couple of decades, with a brilliant set that is backed up by a cast brimming with talent. 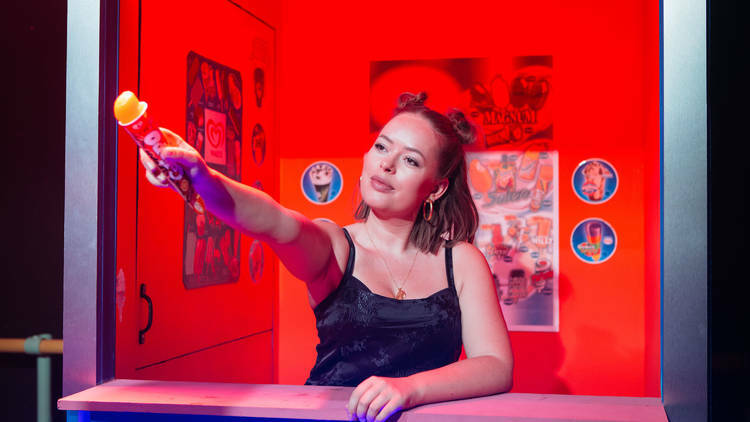 Ella (Tanya Burr) is a young woman looking for a way to make a quick buck, and doesn’t mind bending the truth to make that happen. Ella charms her way through three different male characters throughout the show. Not only the three males go along with her plans, they each in their own way fall for Ella. After a brief period of success, a series of events brings Ella’s plans into disarray, leading to her having to answer to some serious questions. From the beginning of the play there are moments which bring laughter from the audience, with specific use of props making for interesting viewing. As the plot unravels you slowly lose interest in the characters. There is a lack of chemistry between them, but the supporting characters of Ruby (Anna Crichlow) and Dean (Will Pattle) keep the audience interested throughout the two acts. The audience does seem to enjoy themselves, even though the small theatre was too hot, due to excessive lighting. Overall, Confidence is an easy watch, with enjoyable moments and gives you a sense of 90’s nostalgia.